39-year-old Brad Penton from New Orleans travels the nation hawking Trump gear near events like this evening’s rally in Duluth. Many fans of President Trump were visible around Duluth first thing this morning in advance of his campaign stop there this evening. Some of them were buying Trump merchandise from a sales tent in an abandoned convenience store parking lot on a busy street corner. The makeshift kiosk was attracting Trump supporters, but also some opponents. Brad Penton, 39, from New Orleans travels the nation hawking Trump gear near events like the one tonight. And Penton has plenty to choose from. Penton said passers-by aren’t shy to express their support for Trump or their dislike of the president. 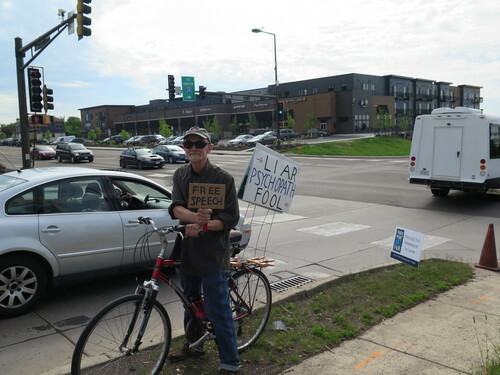 Duluth resident Dave Sorensen sat on his bike on the same corner with signs calling Trump a liar, a psychopath and fool. "We have an absolutely corrupt con man for a president, and he's trying to undo a hundred years of progress just to serve his cronies," he said. Closer to canal park outside the area where Trump is to speak, there were many more Trump supporters than opponents. Among them was Randal Thom who lives in the southwestern Minnesota town of Lakefield. “We have a group we call ‘Front Row Joes,’ and we got here yesterday at noon and we camped out overnight and we help people get to the proper spot in the rally and then we get in there and we lead cheers and have fun," he said. Thom said he’s been to more than 30 Trump rallies across the country. He’s delighted his political hero is coming to Minnesota. 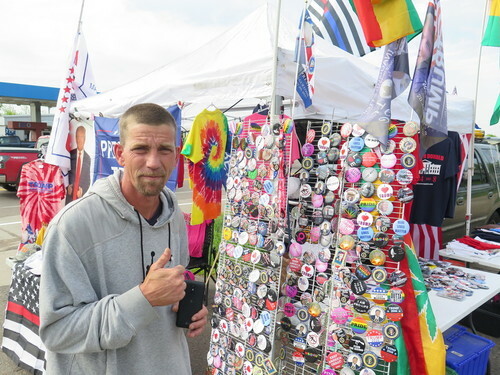 Back at that merchandise tent, Brad Penton says he makes what he calls an “honest living” selling Trump gear. But he won’t go on the record as a Trump supporter.